"BZZ" redirects here. For other uses, see Bzz (disambiguation). Royal Air Force Brize Norton or RAF Brize Norton (IATA: BZZ, ICAO: EGVN) in Oxfordshire, about 75 mi (121 km) west north-west of London, is the largest station of the Royal Air Force. 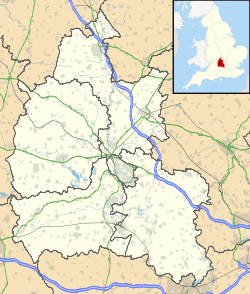 It is close to the settlements of Brize Norton, Carterton and Witney. See Based units section for full list. The station is home to Air Transport, Air-to-Air refuelling and Military Parachuting, with aircraft operating from the station including the Lockheed C-130 Hercules, Boeing C-17 Globemaster III, Airbus A400M Atlas and Airbus Voyager which replaced the now-decommissioned Vickers VC10 in September 2013 and the Lockheed TriStar in March 2014. Major infrastructure redevelopment began in 2010 ahead of the closure of RAF Lyneham in 2012, at which point Brize Norton became the sole air point of embarkation for British troops. By the end of June 2011 all flying units from RAF Lyneham had moved to RAF Brize Norton. Construction of RAF Brize Norton began in 1935 with the official opening taking place on 13 August 1937. The station was originally to be named RAF Carterton, given its proximity and relationship with the town of the same name, but was instead named RAF Brize Norton to avoid possible confusion with RAF Cardington in Bedfordshire. The station's first unit, No. 2 Flying Training School (2 FTS) transferred from RAF Digby in Lincolnshire on 7 September 1937. On 10 October 1938, 2 FTS was joined by No. 6 Maintenance Unit (6 MU). One of the first operational squadrons to use the airfield was No. 110 Squadron which was mainly based at RAF Wattisham but a detachment used Brize Norton from June 1939 with the Bristol Blenheim Mks I and IV. 2 FTS was renamed No. 2 Service Flying Training School (2 SFTS) in September 1939, when it re-equipped with the Airspeed Oxford. No. 16 Service Training School, equipped with North American Harvards moved to Brize Norton in June 1940. On 16 August, the airfield was attacked by German bombers, with 35 Oxfords and 11 Hawker Hurricanes destroyed. 16 SFTS left later that year, but 2 SFTS and 6 MU continued to use the airfield, with No. 1525 Beam Approach Training Flight arriving in February 1942. The No. 110 Squadron detachment left Brize Norton on 17 March 1942, when the squadron departed for the Far East. The two flying training units left on 16 July 1942 to make way for a new user, the Heavy Glider Conversion Unit (HGCU), equipped with Whitley glider tugs and Horsa gliders. No. 296 Squadron and No. 297 Squadron both moved in on 14 March 1944 with their Armstrong Whitworth Albemarles, displacing the Heavy Glider Conversion Unit, which moved to RAF North Luffenham. The two Squadrons took part in the Invasion of France on 6 June 1944 and Operation Market Garden in September 1944, before No. 296 Squadron added the Handley Page Halifax V to their inventory and moved to RAF Earls Colne on 29 September 1944. No. 297 Squadron also moved to Earls Colne a day later. The HGCU (soon renumbered 21 HGCU) returned on 15 October 1944, remaining at Brize Norton until 31 December 1945. The Transport Command Development Unit (TCDU) moved in during 1946, operating a variety of equipment until it departed in June 1949. No. 297 Squadron returned after the Second World War ended, on 5 September 1946 with the Halifax Mks A.7 and A.9 from RAF Tarrant Rushton before leaving on 21 August 1947 for RAF Fairford. After the TCDU left in June 1949, 2 Squadron of the Central Flying School, equipped with Harvards, moved in, followed by No. 204 Advanced Flying School, equipped with de Havilland Mosquitos, staying at Brize Norton until March and June 1950 respectively. By 1950 elements of Strategic Air Command (SAC) were based at RAF Lakenheath, RAF Marham, and RAF Sculthorpe. The increasing tension of the Cold War led to a re-evaluation of these deployments. By 1953 SAC bombers began to move further west, behind RAF fighter forces, to Brize Norton, RAF Greenham Common, RAF Upper Heyford, and RAF Fairford. As with the other stations it occupied, SAC invested heavily in extending the runway (6,000 to 9,000 ft (1,829 to 2,743 m)), taxiways and dispersals, as well as constructing accommodation and weapons handling facilities. This work was completed in April 1951. The station was transferred from USAFE to SAC effective from 8 December 1952. 30th Air Depot Wing became the 3rd Air Force unit responsible for control of all personnel at Brize Norton, upon receipt of instructions to control base functions. The station was assigned to the 7th Air Division and operated by the 3920th Air Base Group, which was renamed as the 3920th Combat Support Group, and then the 3920th Strategic Wing in 1964. The 3920th ceased operations in 1965. The first major USAF deployment was that of 21 Convair B-36 Peacemaker strategic bombers of the 11th Bomb Wing for eight days in June 1952. Boeing B-29 Superfortress and the KB-29 tanker variant of the 301st Bombardment Wing were based at Brize Norton on temporary duty from December 1952 to April 1953. From September 1953, units equipped with the Boeing B-47E Stratojet six-engined bombers began to be deployed to Brize Norton on 90-day temporary deployments, with boom-equipped Boeing KC-97G Stratofreighters also being deployed in support from December 1954. Brize Norton was closed for runway repairs in 1956. B-47 Stratojets returned in July 1957. Later deployments included KC-97 and Boeing KC-135 Stratotanker and the first Convair B-58 Hustler and Boeing B-52 Stratofortress bombers to land in the United Kingdom. From 1958, B-47 deployments changed from 90-day temporary deployments to 30-day Reflex Alerts, in which the aircraft did little flying, but were held at a high degree of readiness (armed with nuclear bombs) on special aprons on the south side of the airbase. In September 1964, the USAF announced that Reflex operations would cease and that Brize Norton would be handed back to the RAF. With RAF Lyneham, the home of RAF Transport Command's Bristol Britannia and De Havilland Comet fleets operating at capacity, the planned introduction to RAF service of the Vickers VC10 and Short Belfast created a requirement for an additional major strategic transport airfield. The planned withdrawal of the USAF, it's long runway and close proximity to army bases in the south of England, resulted in Brize Norton being selected for the role in 1963. While the base was formally returned to the RAF on 1 April 1965, the last SAC aircraft, a B-47E of the 380th Bombardment Wing left the base on 3 April, while USAF personnel finally left on 31 May. Both No. 10 Squadron, equipped with the Vickers VC10 C.1 jet transport and No. 53 Squadron equipped with the Short Belfast C.1 heavy lift turboprop freighter moved from RAF Fairford in May 1967. As facilities at Brize Norton were still unfinished, they used RAF Lyneham as a passenger terminal until October 1968. In 1970 two squadrons 99 Squadron and 511 Squadron operating the Bristol Britannia moved from RAF Lyneham. Both squadrons were disbanded in 1976, along with 53 Squadron, operating the Short Belfast C1 heavy lift turboprop freighter. In the same year, 115 Squadron moved from RAF Cottesmore operating the Hawker Siddeley Andover in the radar calibration role. The squadron moved to RAF Benson in 1983. 101 Squadron reformed at Brize Norton on 1 May 1984, 101 Squadron flew converted civil VC10s, heavily modified and updated by British Aerospace for military service as aerial refuelling tankers between 1983 and 1993. Of the 39 airline aircraft acquired by the RAF, 13 were converted, while the remainders were used for spare parts. These converted VC10s were all 3-point tankers; capable of refuelling one aircraft (typically another large aircraft) using the main hose or two smaller aircraft using the underwing pods. The variants were known as K.2, K.3 and K.4. Following the Falklands War, the RAF found itself lacking in the strategic transport capabilities required to sustain the expanded military presence there. As a result, 216 Squadron was reformed at Brize Norton in November 1984, initially flying six ex-British Airways TriStars, followed by three more from Pan-Am. 10 Squadron's VC10 C.1s were later modified with underwing AAR refuelling pods, and were redesignated On 14 October 2005, 10 Squadron was disbanded, the aircrew and aircraft were merged with 101 Squadron. On 23 May 2001 the RAF's first C-17 arrived at Brize Norton, one of six to be delivered to 99 Squadron. Work to repair and upgrade the runways commenced in April 2007, and repatriation of British personnel was transferred to RAF Lyneham at the same time. With the closure of RAF Lyneham taking place in late 2011, the repatriation transferred back to Brize Norton on 8 September 2011. To accommodate the repatriation services, a purpose-built centre was constructed, and an exit gate was refurbished and formally named the Britannia Gate. On 25 August 2017, the station's Air Movements Squadron merged with No. 1 Air Mobility Wing (1AMW). The wing is a high readiness unit providing early entry air movements support and forms part of the RAF's A4 Force which specialises in logistic support for expeditionary air operations. Brize Norton is already a major airbase for the RAF's transport fleet. However, the end of flying from RAF Lyneham in September 2011 will signal Brize Norton becoming the sole "Air Point of Embarkation", the main operating base for RAF air transport and in-air refuelling aircraft, and home to 15% of RAF uniformed manpower. 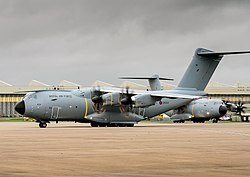 All the RAF's fixed wing transport assets will then be consolidated at Brize Norton, with the transfer of the entire Hercules force, together with the entry into service of the Airbus A400M and the Voyager. To accommodate this expansion (with the number of aircraft stationed at Brize Norton increasing from 28 to 67), a major infrastructure redevelopment, "Programme Future Brize" was established in 2009. The project involves the overhaul of virtually every element of the airfield's infrastructure, including IT, engineering, housing and personnel. On 25 January 2011, a new station chapel and chaplaincy centre was opened by the RAF Chaplain-in-Chief, The Venerable (Air Vice Marshal) Ray Pentland. By March 2011, 70 buildings had been refurbished on the station. As part of work to prepare for the introduction of Voyager aircraft into active service, a new hangar and office complex was opened in the same month. The Hercules fleet at RAF Lyneham officially moved to Brize Norton on 1 July 2011. The final four aircraft flew to the station, conducting a flypast over Wiltshire. Group Captain John Gladstone, Station Commander of RAF Lyneham, flew the lead Hercules, which carried the standards of the Hercules squadrons. These were presented to the Station Commander of RAF Brize Norton, Group Captain Dom Stamp in a welcoming ceremony. In February 2012, work started on converting a World War II hangar located north of the main airfield site into new accommodation for the RAF Tactical Medical Wing (TMW) and No. 4626 (County of Wiltshire) Aeromedical Evacuation Squadron (RAuxAF). The work, which cost £15 million, included provision of a single storey temperature controlled facility within the hangar for the TMW's operational stores facilities, office accommodation, a training building and external training area. The facilities opened in July 2013 and allowed the TMW and No. 4626 Squadron to move to Brize Norton from RAF Lyneham. A new maintenance hangar capable of accommodating three Airbus A400M Atlas aircraft was officially opened by Minister for Defence Procurement Guto Bebb on 1 February 2018. The hangar, located on the eastern side of the airfield, cost approximately £70 million and has a floor space of 24,000 square metres. During 2018, No. 2 Squadron RAF Regiment moved to the station from RAF Honington in Suffolk, completing the move in September of that year. The squadron provides protection to the Air Mobility Force. Like many UK military bases (e.g. RAF Fairford, Faslane Naval Base, RAF Lakenheath, and Menwith Hill) RAF Brize Norton has been subject to limited protests by peace demonstrators. A peace camp was held at the station from 21 to 25 April 2005, along with a demonstration in nearby Carterton. On 12 August 2006, campaigners restricted access at the main entrance for several hours in a protest against British policy in the Middle East. RAF Brize Norton's mission statement is to 'Generate rapid global mobility that deters conflict, defends the UK, defeats the country's enemies, assists in times of crisis'. The station is the largest in the RAF in terms of personnel and is home to approximately 5,800 military staff, 1,200 contractors and 300 civilian staff. The station accommodates the RAF's strategic and tactical air transport and air-to-air refuelling fleets, operating the Lockheed C-130 Hercules, Boeing C-17 Globemaster III, Airbus A400M Atlas and Airbus A330 MRTT Voyager. The station is home to the Administrative Wing, Airport of Embarkation Wing, Depth Support Wing, Forward Support Wing and Operations Wing. Lodger units are the RAF Police, Joint Air Delivery Test and Evaluation Unit (JADTEU) - a tri-service unit that tests and evaluates air transportation methods, No.1 Parachute Training School RAF and No 1 Air Mobility Wing - An air combat support unit on high readiness to deploy specialist Movements personnel worldwide. RAF Brize Norton Flying Club resides at the station providing low cost flying for MOD personnel and training to PPL level and above. Initially operating two Cherokee aircraft today, the fleet consists of two Piper Warriors painted in pseudo-"training black" (actually dark blue) to enhance visibility in line with RAF training aircraft policies. AirTanker Services is operating the RAF's Airbus A330 MRTT (Future Strategic Tanker Aircraft) to provide aerial re-fuelling services at Brize Norton. Flying and notable non-flying units based at RAF Brize Norton. A partial list of units previously based at Brize Norton. No. 53 Squadron RAF (1967–1976) - Short Belfast C1. No. 115 Squadron RAF (1976–1983) - Armstrong Whitworth Argosy, Hawker Siddeley Andover. No. 296 Squadron RAF (1943–1944) - Armstrong Whitworth Albemarle. No. 297 Squadron RAF (1944) - Armstrong Whitworth Albemarle. No. 511 Squadron RAF (1970–1976) - Bristol Britannia. No 241 Operational Conversion Unit RAF - Training and checking crews for Belfast, Britannia and VC10. Brize Norton's badge, awarded in January 1968, features a knight’s helmet with two blue ostrich feathers against the backdrop of an arched castle gateway. The gateway represents the station's role as the hub for UK troops and transport aircraft departing on worldwide operations. The helm represents the military personnel carried from the station. The station's motto (Transire confidenter) is in Latin and translates into English as Pass through confidently, again acknowledging the station's gateway role. Unlike many RAF stations, Brize Norton does not have an aircraft on display as a gate guardian. In October 2017 however, a sculpture by local artist David Harber was unveiled to mark the station's 80th anniversary. Named Gate Guardian, the metal sculpture depicts a globe circled by four of Brize Norton's aircraft, an Atlas, a Voyager, a Globemaster and a Hercules. RAF Brize Norton enjoys the freedom of Carterton, Exeter, and Torbay. The station magazine is called 51º North, in reference to the latitude of Brize Norton (51º 45'). The magazine is distributed to station personnel, their families and the local community and is available on-line. The station featured in the 2013 observational documentary series Inside RAF Brize Norton. The seven-part series followed activity at the station during 2012 and was shown on Sky One. ^ Pine, L.G. (1983). A dictionary of mottoes (1 ed.). London: Routledge & Kegan Paul. p. 236. ISBN 0-7100-9339-X. ^ "Defence Estates Development Plan 2009 – Annex A". GOV.UK. Ministry of Defence. 3 July 2009. p. 32. Retrieved 27 February 2019. ^ "RAF Brize Norton Defence Aerodrome Manual". Royal Air Force. Military Aviation Authority. 17 January 2019. Retrieved 22 March 2019. ^ "RAF Brize Norton". Royal Air Force. 2011. Retrieved 5 March 2011. ^ "The 'End Of An Era' For The Queen Of The Skies". Royal Air Force. 26 September 2013. Retrieved 10 February 2017. ^ "TriStar Retires After 30 Years Service with the RAF". Royal Air Force. 25 March 2014. Retrieved 4 August 2014. ^ Hearn, Dan (4 February 2011). "RAF Brize Norton to double in size". This is Oxfordshire. Retrieved 5 March 2011. ^ "Station History". RAF Brize Norton. Archived from the original on 11 December 2009. Retrieved 21 October 2018. ^ "Brize Norton: Introduction | British History Online". www.british-history.ac.uk. Retrieved 19 September 2016. ^ a b Jefford 1988, p. 55. ^ Jenkins, Stanley C (2014). Oxfordshire At War Through Time. United Kingdom: Amberley Publishing Limited. ISBN 9781445619460. ^ a b c d e Jefford 1988, p. 84. ^ "30 AIR DEPOT WING, OPERATIONS PLAN 2-52 30 AIR DEPOT WING, INABILITY OF THE 30 AIR DEPOT WING TO PERFORM ITS MISSION (CASE REPORT NO. 1: SURVEY INSPECTION) TRANSFER OF ROYAL AIR FORCE STATION, BRIZE NORTON, ENGLAND FROM UNITED STATES AIR FORCES IN EUROPE TO STRATEGIC AIR COMMAND". Air Force History Index. Retrieved 8 July 2018. ^ "VC10s and Belfasts to be Based at Brize". Flight International. Reed Business Information: 1043. 18 June 1964 – via Flight Global Archive. ^ Jefford 1988, p. 53. ^ a b Jefford 1988, p. 95. ^ a b Jefford 1988, p. 57. ^ Jefford 1988, p. 54. ^ Jefford 1988, p. 71. ^ Gillan, Audrey (25 February 2010). "How Wootton Bassett became the town that cried". The Guardian. Retrieved 8 July 2018. ^ Morris, Steven (8 September 2011). "RAF Brize Norton expects 2,000 people as military repatriations return". London: The Guardian. Retrieved 14 September 2011. ^ "RAF Brize Norton ceremony marks Lyneham transfer". BBC News. 1 September 2011. Retrieved 26 June 2012. ^ "Project Hadron Successfully Completed" (PDF). 51º North. Issue 7 – 2017: 15. ^ "Brize Norton continues its evolution into main RAF hub". Ministry of Defence. 1 February 2011. Retrieved 5 March 2011. ^ Heath, Ashley (31 August 2010). "RAF Lyneham Closure Plan". BBC. Retrieved 5 March 2011. ^ "RAF Lyneham relocates to Brize Norton". BBC News. 1 July 2011. Retrieved 22 July 2011. ^ "RAF Brize Norton - Programme Future Brize". Royal Air Force. 2011. Retrieved 4 May 2011. ^ "New Stn Chapel and Chaplaincy Centre". RAF Brize Norton. 28 January 2011. Archived from the original on 11 April 2012. Retrieved 29 October 2018. ^ "Housing shortages at Brize Norton caused by funding constraints". BBC News. 9 March 2011. Retrieved 22 July 2011. ^ "New hangar opens for tanker aircraft at RAF Brize Norton". BBC News. 31 March 2011. Retrieved 22 July 2011. ^ Mooney, Tom (1 July 2011). "Mixed emotions as Hercules leave RAF Lyneham". Gazette & Herald. Retrieved 15 April 2012. ^ "Work starts on medical support facilities at Oxfordshire air base". Cision. 17 February 2012. Retrieved 21 October 2018. ^ "DIO opens RAF Brize Norton Tactical Medical Wing facilities - Government Opportunities". Government Opportunities. 4 July 2013. Retrieved 21 October 2018. ^ "Atlas aircraft hangar opened by Defence Minister". Royal Air Force. 1 February 2018. Retrieved 5 February 2018. ^ Cooper, Tim (25 September 2018). "RAF Regiment Squadron Receives New Standard". Forces Network. Retrieved 18 October 2018. ^ "Activists lay down on runway". War Resister's International. 1 March 2003. Retrieved 5 March 2011. ^ "Rowdy teens break peace at Brize camp". Oxford Mail. 30 April 2005. Archived from the original on 15 May 2012. Retrieved 5 March 2011. ^ "RAF Brize Norton blockaded". UK Indymedia. 12 August 2006. Retrieved 5 March 2011. ^ "RAF Brize Norton". RAF Brize Norton. Retrieved 29 December 2017. ^ "RAF Brize Norton". RAF Brize Norton. Retrieved 21 December 2018. ^ "RAF Brize Norton Flying Club". RAF Flying Clubs' Association. Archived from the original on 2 February 2008. Retrieved 22 July 2017. ^ Lake, Alan (1999). Flying units of the RAF : the ancestry, formation and disbandment of all flying units from 1912. Shrewsbury: Airlife. p. 144. ISBN 1-84037-086-6. ^ a b "RAF Brize Norton". RAF Heraldry Trust. Retrieved 18 October 2018. ^ Rust, Stuart (15 October 2017). "80 years of RAF Brize Norton celebrated with sculpture". Oxford Mail. Retrieved 18 October 2018. ^ Archer, Megan (21 April 2016). "RAF Brize Norton honoured to receive Freedom of the Town of Carterton". Oxford Mail. Retrieved 20 October 2018. ^ "RAF Brize Norton granted freedom of Exeter". BBC News. 21 October 2013. Retrieved 20 October 2018. ^ Henderson, Guy (15 September 2018). "RAF's biggest base to get the Freedom of Torbay". Devon Live. Retrieved 20 October 2018. ^ "Royal Air Force Brize Norton". Forces Publishing. Retrieved 20 October 2018. ^ "Behind the scenes at RAF Brize Norton". GOV.UK. Ministry of Defence. 21 November 2013. Retrieved 20 October 2018. Jefford, C.G, MBE,BA ,RAF (Retd). RAF Squadrons, a Comprehensive Record of the Movement and Equipment of all RAF Squadrons and their Antecedents since 1912. Shrewsbury, Shropshire, UK: Airlife Publishing, 1988. ISBN 1-84037-141-2. March, Peter R. "RAF Brize Norton: Part 1". Aircraft Illustrated, June 1982. Vol. 15, No. 6. pp. 268–273. March, Peter R. "RAF Brize Norton: Part 2". Aircraft Illustrated, July 1982. Vol. 15, No. 7. pp. 320–323. Wikimedia Commons has media related to RAF Brize Norton.